We have a serious predator. Mary's twin girl (on the left) has disappeared. This was not a helpless newborn; she was over five weeks old. This makes two lambs in two days. I cannot fault a wild animal for going after my sheep. Given the choice of snatching a lamb from a small fenced in area or chasing down a rabbit or deer in the forest, I, too, would choose the lamb. And if there are more where the first one came from, well, you might as well help yourself to another. This, of course, does not mean that I am not stricken with grief (and in a bit of a panic). As I said yesterday, I have never before lost a lamb to a predator on this farm (though we are surrounded by coyotes). 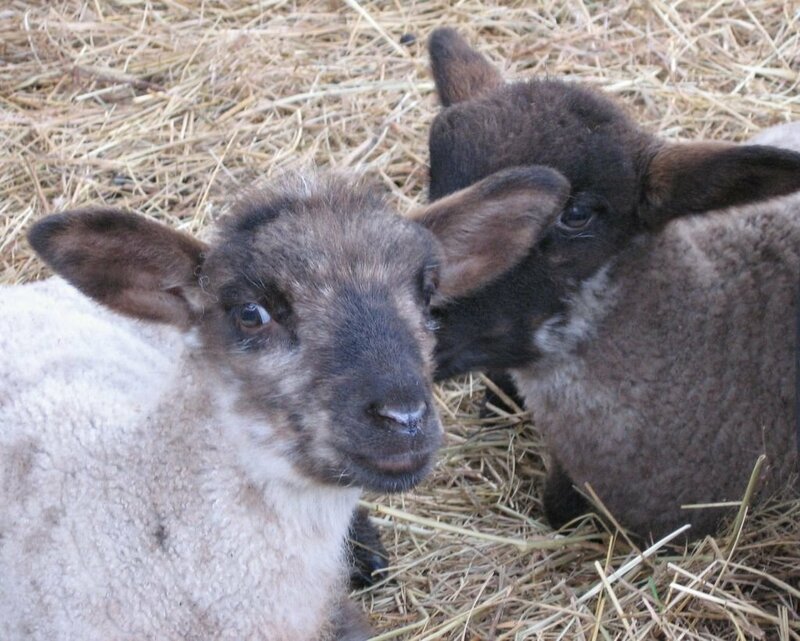 Mary (who is Doll Face's sister), is one of my very best sheep, and I was thrilled when she had a twin girl. Her baby was my best replacement ewe born so far this year. She held a special place in my heart, too, as I successfully performed minor surgery on her to fix an inverted eyelid. The sheep have been penned in their 1/4-acre barnyard (connected to the barn) since the first lamb was born two months ago. Now I will lock them in the actual barn at night. It will be difficult to do, and they will not be happy, but at least they might be safe. Sadness and tragedy are always looming here. This is a farm. These kinds of things happen. And while I never had any intention of sharing every unpleasant detail of my life with you, I felt I should explain what is going on--the continutation of the story, so to speak. What I had planned to write about today was my new Chocolate Chip Almond Biscotti recipe after making one final test batch. Kitchen (and chocolate) therapy. Who knows. Maybe there is still time. I know I must do something. I am so sorry; lock them up tonight and as long as you have to, in order to protect the rest of the babies. If you think it was some rogue, cruel lamb-knapper, let me have at them!!! It's a terrible thing, and as you say, on a farm, that kind of thing happens. However, I'd call the Game, Fish, and Parks people and see if there's anything that they'll do to help with the wildlife management. Wildlife and people have to live harmoniously, and once those coyotes develop a taste for lamb, there's no end. Ooohh, I'm so sorry about the baby lamb! How absolutely horrid! I had to send you a note to let you know that Gladys Tabor was one of my mother's favorite authors, and has been a favorite of mine for many years! I was so pleasantly surprised to see her name! Susan-I think you need to take to the Llamas and the lovely Dan and tell them to do a better job or they will be eating hay again!! I am sorry about another loss. I had a bad day yesterday and you won't believe what I baked?? Biscotti! What are the odds? lol! What's with the dogs? I thought dogs barked like crazy and chased predators after their charges? I am mystified. Wasn't there an alarm of any kind? My friend who had lambs used to sleep in the barn with them. You may want to pull up some straw and settle in for a while. And get another dog. So unnerving, and so sad. It's hard to feel too much sympathy for coyotes (here in the Boston area they routinely nab people's cats and even recently someone's old Westie who was playing in her backyard). I do think immediately of one of those nice Italian Maremmana dogs--giant white sheep-guardians who would wreak unrepentant havoc on any coyote who dared come near a lamb. Good luck in the meantime. Thanks. Yep, I'm plotting all kinds of tactical maneuvers right now. I only wish it were. Thanks for the tip. We are actually allowed to shoot coyotes on the property (and have done this in the past, although we don't like to). But of course you have to see them to shoot them, and they can be extremely sneaky. Yes, the worst part is once a predator develops a taste for something. That is my main concern regarding the current situation. I definitely need to read more of Gladys Taber's work. She was a wonderful writer, and I highly recommend her to anyone interested in food/cooking/cats/dogs/country life. She wrote about it all with a lovely "voice" and charming sense of humor. I am actually thinking of putting the llamas back in the pen next adjacent to the barnyard where they spent the winter. It, too, backs up to the hillside that I think the coyote probably comes down, so maybe their presence over there was helping. Considering what our dogs are up against, they do an amazing job. As I said, in four previous years of lambing, we didn't have a single loss--and that was without Donkey Doodle Dandy and the llamas. Just the dogs. They are up most of every single night, barking like mad, patrolling all over the farm in the pitch dark, chasing off everything from coyotes to deer to armadillos to rabbits to skunks--and putting in at least 110%. I wouldn't be surprised if there are 30 or more coyotes living around here. And they are smart animals. The previous owner of the farm I used to live on kept a lot of chickens that were out loose. He literally saw two coyotes working together: one coyote would catch the attention of his extremely competent guard dog while the second coyote snagged a chicken. I am actually extremely proud of our dogs. Oh, that's terrible about coyotes in Boston. I lost several of my cats (including my all time favorite one) to coyotes at the first Missouri farm I lived on. It was horrible. When I first bought my flock, the seller (who is now a good friend and who supplies me with all of my rams) threw in an AKC Great Pyrenees guard dog for free. In theory, this would have been an ideal set up--the dog lives with the sheep all the time, sleeps with them, guards them. In reality it was a horrible nightmare. We already had two dogs, and this dog wanted absolutely nothing to do with the sheep and everything to do with living in the yard with the other dogs. It escaped as often as it could, often making holes in fences that the sheep then got through. When he started killing lambs, well, that was the end of that. Of course I know all Great Pyrenees and other "sheep dogs" are not like this--I only tell this story as another example of how many different things we've tried/done to help protect the sheep. One of the problems in that situation was already having two dogs. First of all, any more than two dogs on a farm just DOES NOT WORK. They pack. And they forget all their good habits and learn new bad ones. It is downright frightening to see what dogs turn into when they pack. One Great Pyrenees or other type guardian dog might work. But finding one that does a super job is much harder than one might think. I know people who have gone through literally dozens of dogs. And of course I have no intention of getting rid of Robin or Bear (who is more of a stockdog, meaning he guards and cares for and works his flock, but he doesn't live with them). Oh, that's just too much! I'm so sorry. Well, after reading comments I know you are doing everything you can to protect your precious bunch of babies. I do hope you get the nabber before another babe is lost. And yes, the wild critters can become very wiley. I know you don't "like" to kill a wild creature -- but sometimes it simply cannot be helped. I am so sorry. As I worked in my yard and garden today, I thought of your loss many times. When I checked your site today, I was saddened all the more. My heart goes out to you and the new mothers of the lambs. We know these things happen in the wild. But, it is harder when it happens to the ones you raise and care for. her "eye out" for your new recipe. Tuck your new babies in under lock and key each night. You could take a lantern, blanket and book out there and "play Little House on the Prairie" until the mystery is solved. I am sure you and the dogs are doing everything possible to protect your flock..it sounds like your tactics are carefully considered and sensible. We are most of us so insulated from the harsher aspects of nature most of the time, especially those of us who live in the city..where the scariest natural phenomenon are generally something to do with our fellow humans. The lambs are so especially heartbreaking because they are babies. I think all baby mammals resemble one another so much, that we feel especially protective of them. Wobbliness, big heads, soft fur or hair. Big soft eyes. People babies, lambs, kittens. Probably baby coyotes, too, I guess. bad coyote. bad bad. here's my city silliness: motion light? Not that you can get one to cover the whole field, but...??? I wouldsay shoot 'em, but that's why we have such few wolves these days. It becomes too easy to shoot. Too bad you can't sit them down at a round table and explain the situation to them. Oh man, this is so lame! I'm a pretty good shot, can I come help? Oh dear.... poor little lambkins! I hope you find the culprit soon. Oh, Susan, I'm so sorry. Lately I have been spending a lot of mental energy on what'll happen when we get sheep or goats. Although we have coyotes, and possibly even bobcats, I suspect the worst threats will be the dogs that run around loose in this area. Frankly, I'm not sure I want to leave any of our dogs out there to potentially be hurt by them. Currently the plan is to herd everyone into a higher-security area at night. I really, really hope it works. And again, I am so pained by your losses and anxious about the developing situation. I'm so sorry to hear about your little lamb. Oh man oh man. I have finally gotten to the point where I don't cry every time a chicken goes missing. But a lamb? I'd be one big teardrop. Hope you can figure out a solution! So interesting about the dogs (and no--I certainly meant no offense to yours! Thirty coyotes--yeesh.) I wonder if that's why there are always so many Great Pyrenees up for adoption on Petfinder--failed sheep-guarders? And yes--dogs in packs...scary. Kind of like teenage boys--a couple of them are fine, but more than three and some trouble's going to happen. Good luck--sounds like security is tight around your place. Oh my goodness ... I'm so very sorry to read about your poor little lamb. I'm so citified, that the idea of a predators usually refers to a wicked person, not an animal. I'm sending you and all your lovely creatures warm, safe, secure wishes. I've missed a couple of days reading, just catching up now and feeling so sorry for you, and the mama's looking for their lambs... so sad. We live near a golf course. There are stories of coyotes around here (in our highly populated area) carrying off small dogs and cats. Not nice!!! I'm sorry about the loss of your precious little one. Losing a Lamb to a Coyote is dreadful. I can imagine what you must have gone through. As mentioned earlier I worked for decades on a Tea Plantation.We always had alot of Poultry and Cows. In India its Jackals we had to contend with,similar to Coyotes in habit.We eventually bought six Geese.They would raise an alarm the moment they heard aything suspicious. Since Geese make a penetrating noise it would scare the Jackals off. It just may work on your Farm.